WAKE UP AMERICA! Big Business and Government want you FAT? Welcome to the page that distinguishes WeightLossFatLoss.US from every other site on the Internet about weight loss. Most people never seem to stop and think the maybe someone somewhere actually wants them to be overweight so that they can profit from their overweight condition. If the headline above is shocking to you then chances are you are one of these people and you will never successfully lose weight and be healthy until you become aware of the greatest factors affecting your weight loss success: GREED and CORRUPTION. 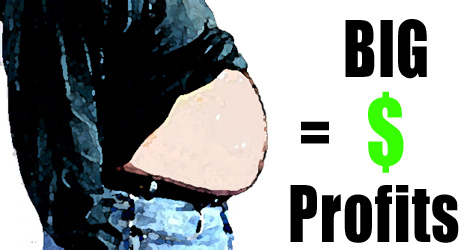 Did you know that most prescription medications will cause you to gain weight! Most people have no idea that one of the listed side effects on just about every best selling prescription medication is actually WEIGHT GAIN. And for some of the medications the weight gain that has been documented is massive, as in over 100 pounds. Yes indeed, the same medication your Doctor convinced you that you needed to take to improve your health may actually be destroying your health by making you fat. If you are taking one of these drugs then you can improve your diet and exercise all you want but you will never lose any weight. Do you know the Greatest Type of Weight Loss Product EVER that THEY are desperate to keep you from using? THERMOGENIC which means "Burn Fat"
Unfortunately the greedy people running the health care system and the pharmaceutical companies do know and THEY have done everything they could to discredit and ban the king of all Thermogenic products which were the Ephedra weight loss products. Why Is America So FAT? brilliantly documents exactly who was behind the Ephedra smear campaign by showing how the same people protected their own products that contain Ephedra and only wanted to eliminate non-prescription Ephedra weight loss products from the marketplace. Simple put, THEY are the Big Businesses in the health care industry and THEY have no desire for the average person to lose weight and be healthy because that would destroy their profits. What may be the greatest testimony to how well Thermogenic weight loss products work is the extent to which THEY have gone to get you to stop using such products. 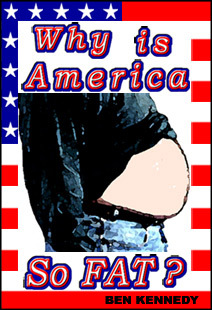 For more about this you can read the article below written by Ben Kennedy before he wrote Why Is America So FAT? If you are ever going to successfully lose weight and live healthy then you better declare your own Declaration of Independence from the Health Care System.